Last summer I had been doing some work in the vicinity, sometimes joining the lunchtime crowd that tends to gather in the area. 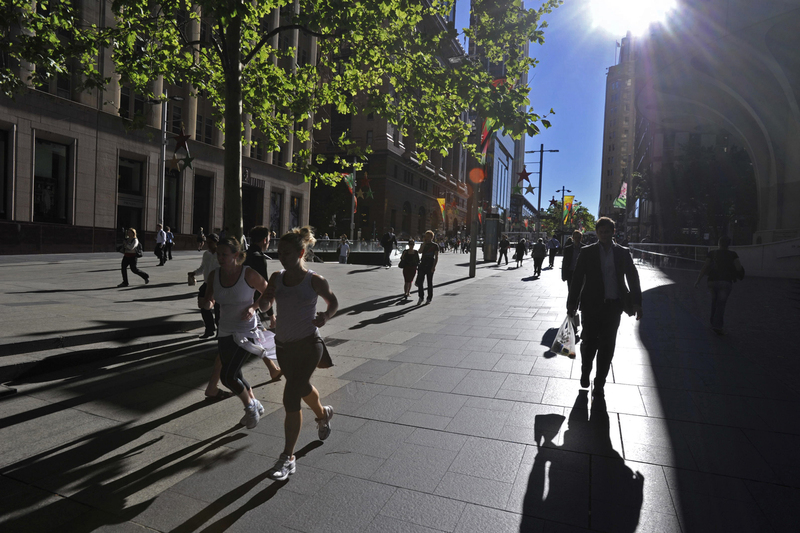 While the people are mostly office workers, there are others such as trades people, shoppers, and the odd ‘hard case’. 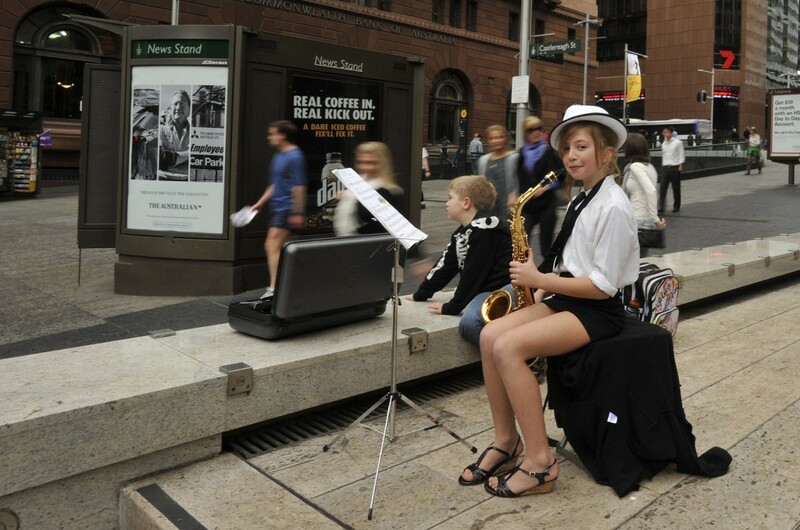 In addition there is entertainment, musicians, or at other times, people dressed in character who might be collecting on behalf of different charities. Also, there are various product displays and council approved advertising for a range of organizations and on some days, demonstrations, promotional give-aways, and certainly plenty of smiles and good humour. At first I just took the odd one or two photos as time permitted. On occasions when in the city, I would time it right, and go out of my way to see what might be happening. Regardless of the weather, I would always investigate, camera in hand. The documentation certainly started from small beginnings, and as my interest grew, so to my dedication to the idea that it may make an interesting photo essay. As can be seen in several of the photographs, there was definitely a positive interaction with many of the subjects. Almost all were extremely accommodating. Most times I would try to acknowledge the subject, or even on occasions, politely thank them having gained the picture. There is certainly a lot more to the Martin Place story, but I think this small selection will give you some idea of a few of those who frequent the space, and some of what goes on on in this particular part or ‘town’. Here are just a few contrasting frames for your enjoyment. 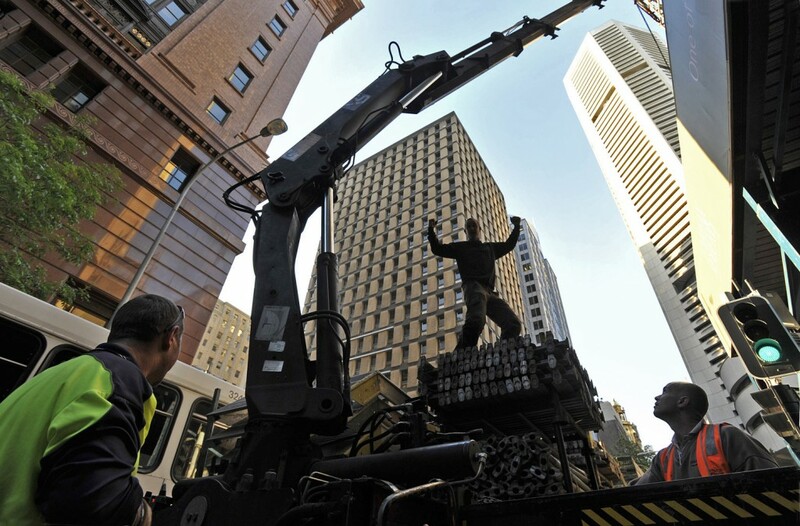 ‘Master of the Load’ a rigger strikes a pose. 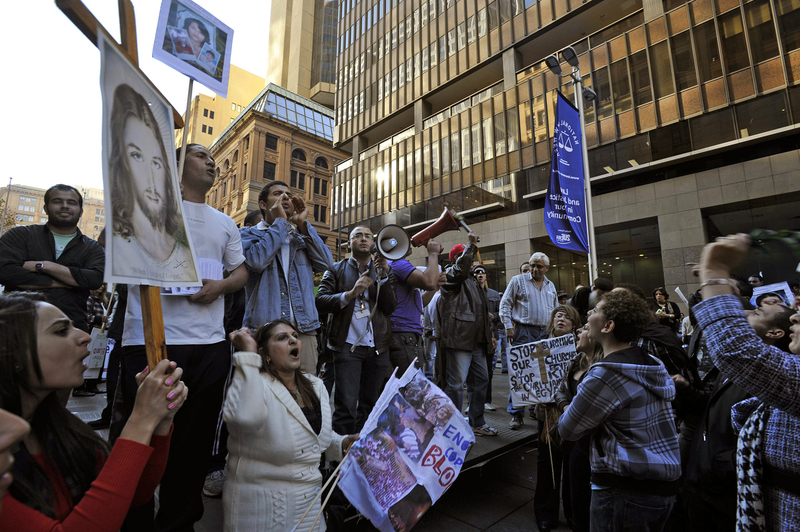 Coptic christians demonstrate against the massacre of their followers by Muslim opponents in Egypt. 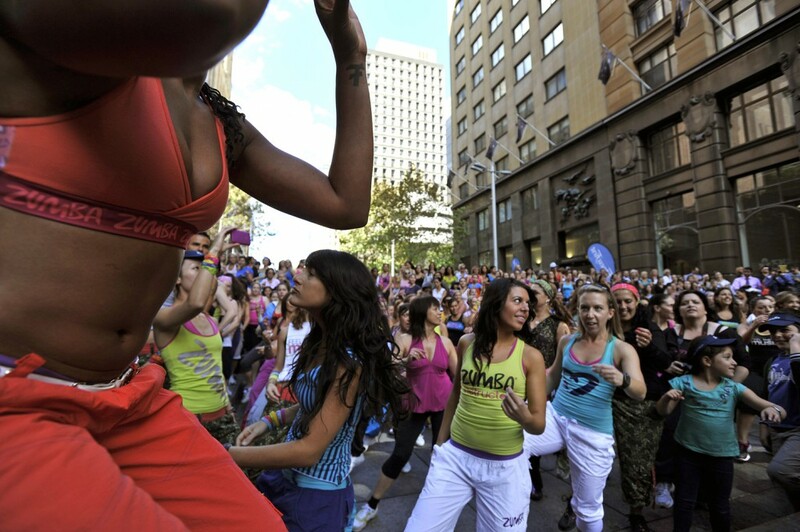 To the delight of exponents, Zumba creator Beto Perez, attended a class sponsored by Fitness First. Advertising her show, a Burlesque dancer poses with firemen from the New South Wales Fire Rescue Dep’t who are seeking monetary support from the lunchtime crowd. 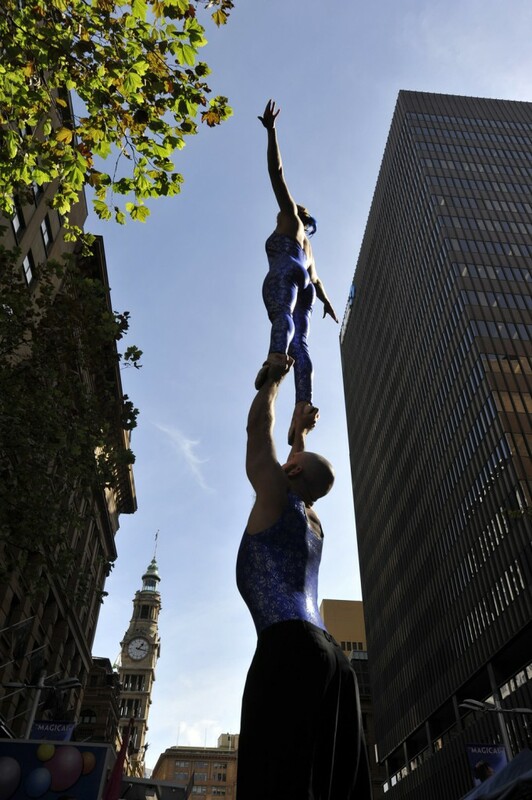 [caption id="attachment_569" align="aligncenter" width="584"] Acrobats entertain at a Starlight Foundation awareness drive. The charity is dedicated to improving the quality of life for children with chronic and life-threatening medical conditions. Bulldog NRL Rugby League players and cheerleaders on a promotional drive. 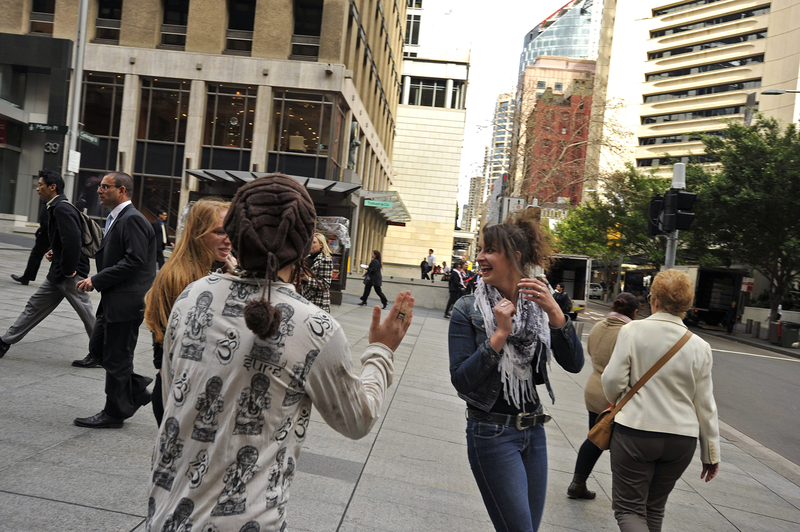 Girl’s reaction to a guy who wanted them to ‘High Five’ him. 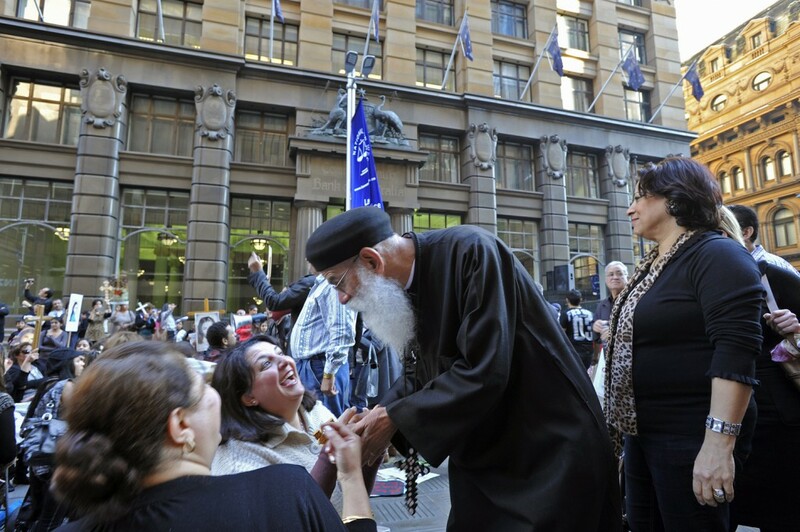 At demonstration by Coptic Christians against Muslim persecution in Egypt, a woman is overjoyed at meeting one of the churches most important clergy. You could unpin a charity voucher from where ever you fancied. He didn’t mind. And yes, the front was way more popular than the back. Despite being on the phone, he certainly caught this woman’s eye. 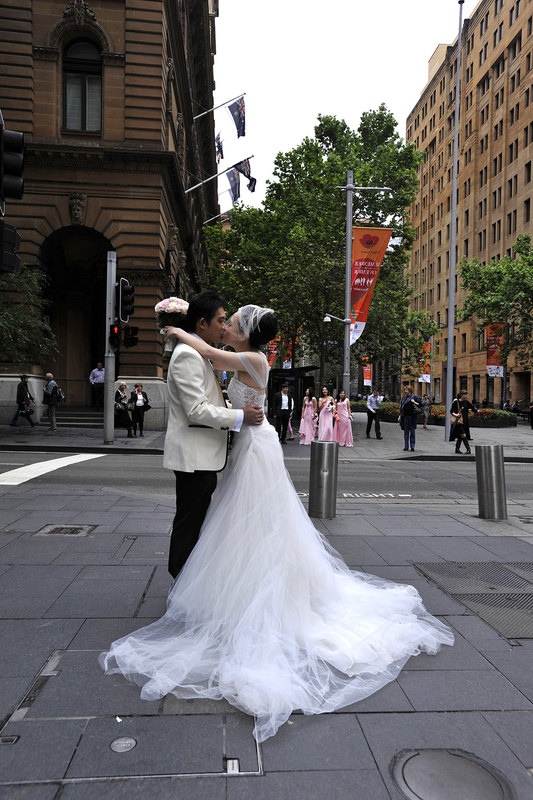 A Japanese groom kisses his bride while posing for a photograph. 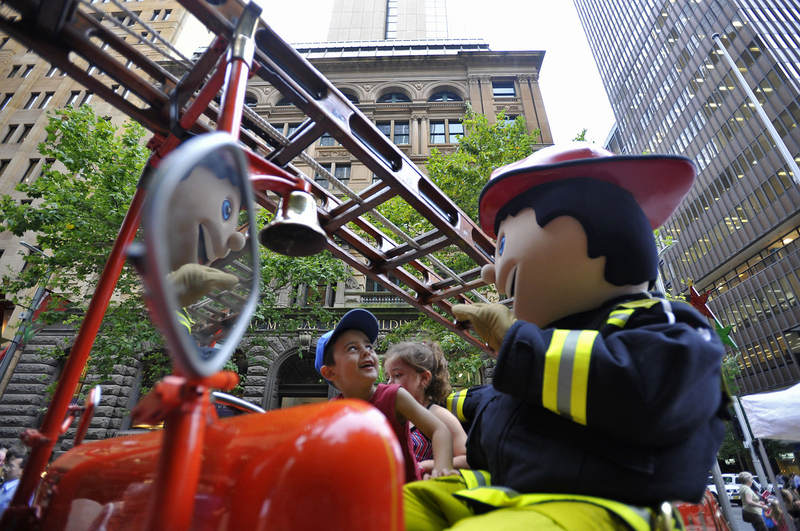 A young boy is enthralled with the ‘larger than life’ fireman on a model of a fire truck on display during NSW Fire Rescue Services week. 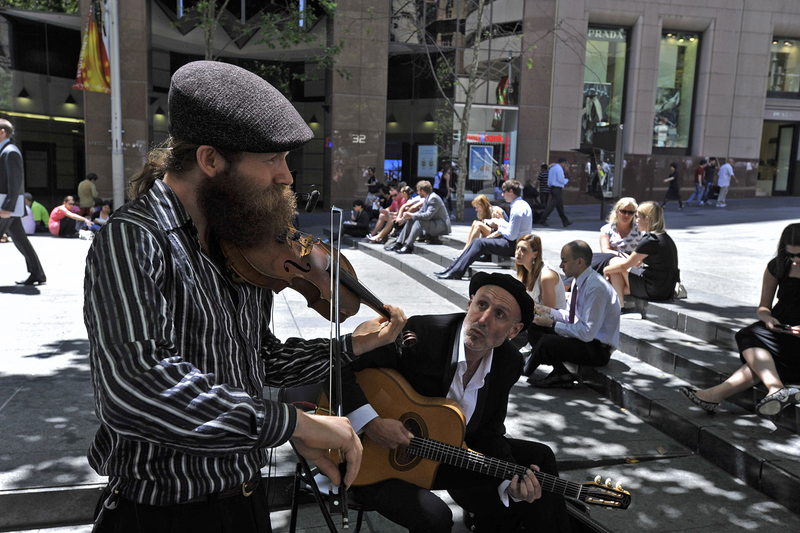 Musicians with a distinctive ‘Folky’ sound entertain the lunchtime crowd. Bikini clad promotion girl raising a few smiles amongst business types in the lunchtime crowd. With the sun down, energetic teenagers perform great moves to driving beat music while skipping. 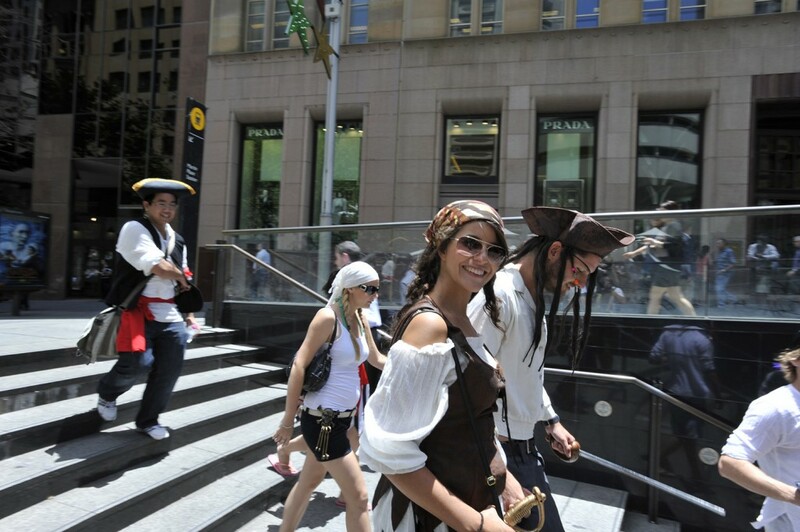 All smiles from the pirates ‘mate’ as they head for the underground railway. The ‘big guy’ poses before the start of the Aimes ‘charity strut’ which supports Indigenous and Torres Strait Island children in furthering their education. Playing the saxophone, a young schoolgirl entertains passers by. 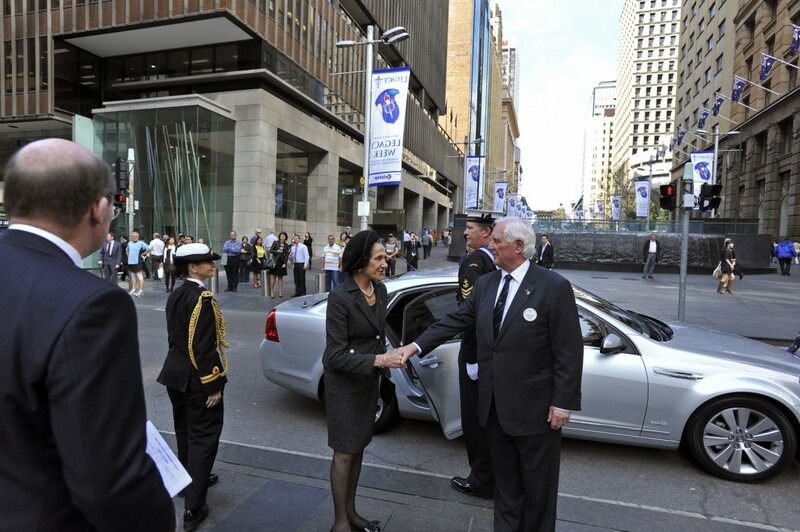 The Governor General of NSW, Marie Bashir arriving for an official function. 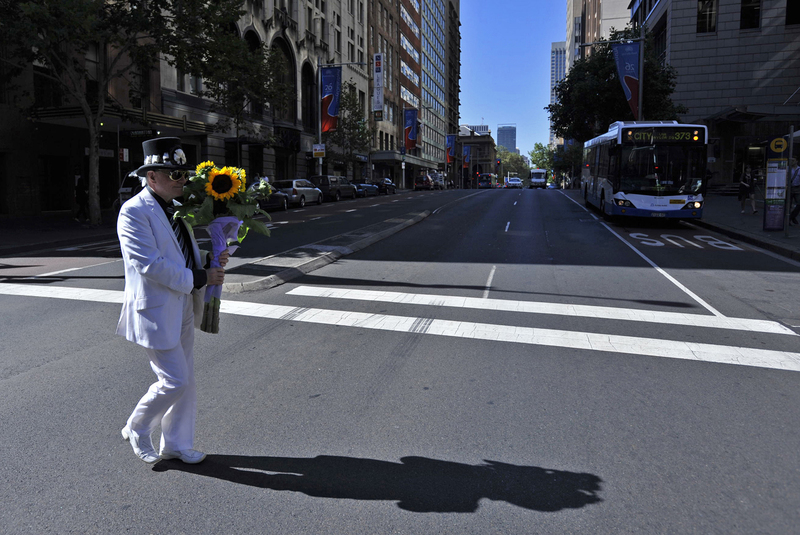 An interesting character crossing Elizabeth Street. Girls in bikini’s and pooches in mandatory ‘budgie smugglers at the Aimes ‘charity strut’ which supports Indigenous and Torres Strait Island children in furthering their education. Jumping around like rabbits is one way of getting noticed. Girl’s, looking sharp and ‘in step’. 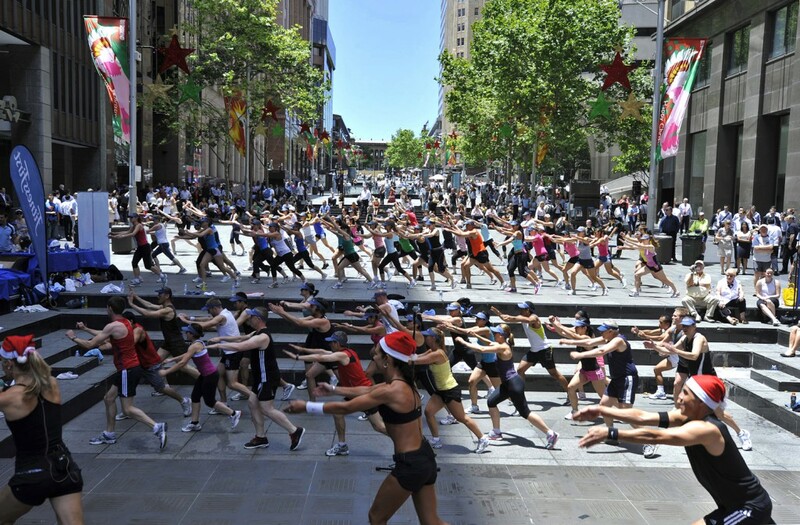 Sweating it out, it’s all exercise for this pre-christmas Fitness First promotion. 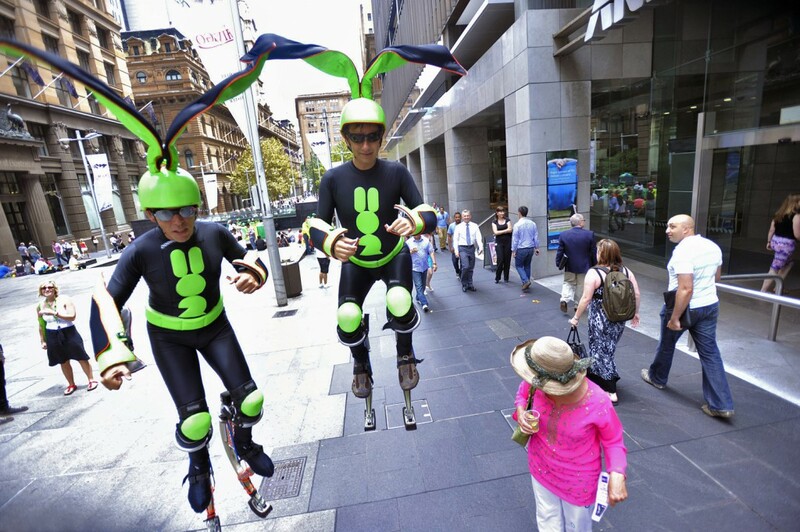 Performance artist’s make a dash for it across Castlereigh Street. 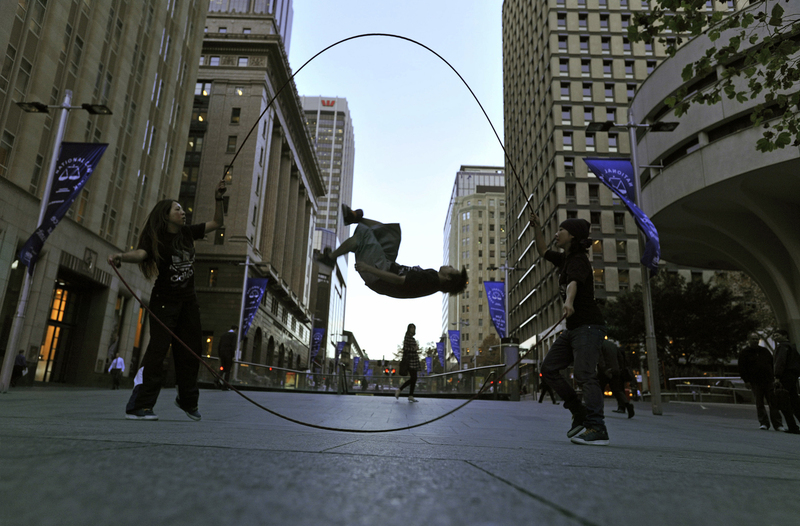 A skateboarder gets some ‘air’ outside the Reserve Bank building. For the fashion conscious, very bright, very shiny, sometimes iridescent, and always well heeled. This entry was posted in Street Photography, Sydney, Travel and tagged Acrobat, Bikini, Bride and Groom, Budgie Smugglers, Burlesque, Chairleaders, Charity, Coptic, Coptic Christians, Coptic Church, Demonstrations, documentary, Entertainment, Fancy Dress, Firemen, Fitness First, High Heels, Jogging, Marie Bashir, Martin Place, Musicians, Performance Art, photography, Protests, Public Spaces, Roller Blading, Rugby League, Skateboarder, Skipping, Strong Man, Sydney, wedding, Zumba by Paul Nevin. Bookmark the permalink.